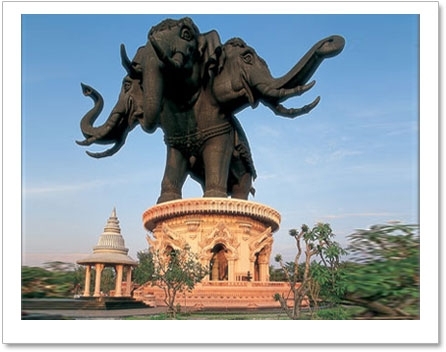 This three-headed elephant, Airavata was born of Khun Lek Viriyapant's ideas and imagination. 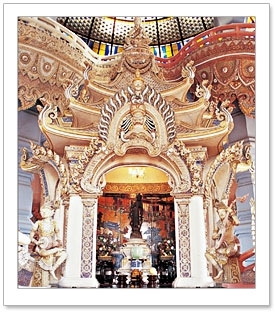 It was inspired by his wish to preserve his collection of antiques as a contribution to Thai cultural heritage. Many of these were priceless objects of art they were also held as sacred objects for people of ancient cultures. According to ancient traditions they were believed to bring blessing and prosperity to the land and its people, and therefore must not be lost to outsiders. It had been Mr.Viriyapant's concern to find a way that would keep these objects safe and that would also be suitable to their traditional functions. One day he had a visit from a Westerner who, during the course of the conversation, suggested the idea of constructing the most important building in the town in the form of an apple, which according to Western traditions of belief, played a crucial part in the shaping of human destiny. Mr.Viriyapant warmly welcomed this suggestion. He nevertheless thought it more appropriate to adhere to Eastern traditions and thus decided on the heavenly elephant Airavata of Hindu mythology. 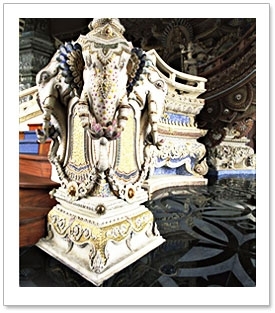 In addition, he wanted this three-headed elephant to be more than just the vehicle of the god Indra. 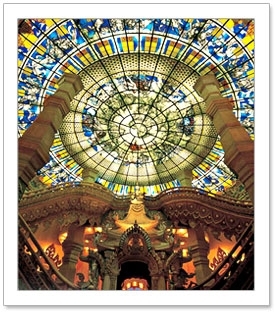 The elephant would be a symbol of the centre of the universe and, as such, the building would function symbolically as the spiritual heart of the land where sacred objects of the land were housed and revered. 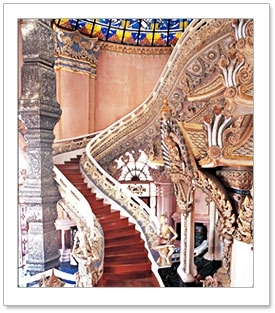 He then designed the building and gave the design to Khun Pagpean Viriyapant, his eldest son, to begin construction. Already during the construction, the building attracted people who came to worship. 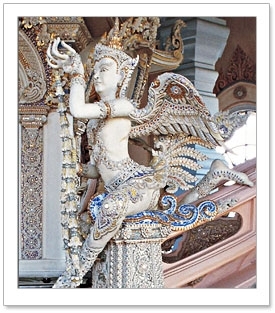 Thus it fulfilled Khun Lek Viriyapant's wish to preserve sacred objects for the country. 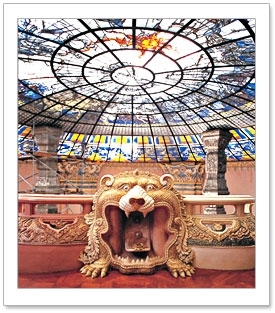 Although both Khun Lek and Khun Pagpean passed away before the construction was completed, their heirs continued their wish to create a place where ceremonies and festivals of Thai traditions might be held, and that would also serve as museum to keep the memory of Khun Lek Viriyapant's life and work alive for future generations.